It is a tough time for relatives of a woman whose children were burnt to death by their stepfather. 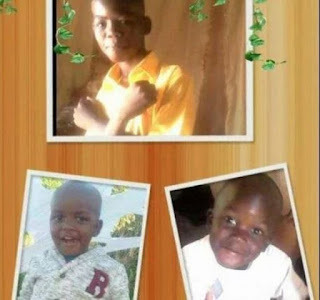 Three small children whose remains were found in a burnt car in Bosplaas West, outside Temba in Hammans- kraal area of South Africa have been buried. The little kids were buried on Saturday, according to IOL. The remains of Omphile Prince Mosana, 4, Obakeng John Mosana, 3,and Bogosi Nevil Mosana, 12, were discovered on January 2. A passerby noticed the burnt-out vehicle in the bushes and made the gruesome discovery. The burials could, however, only take place on Saturday as an inquest docket had been opened and police investigations were pending. Post-mortem examinations also had to be done on the bodies. The three children were locked in a vehicle and burnt alive, apparently by their mother’s boyfriend who later hanged himself. The 40-year-old man was found hanging inside his RDP house while the police were searching for him. A small crowd of mourners, including pupils from the schools the children attended, witnessed the three small coffins sink simultaneously into three holes at the community cemetery in Ramotse Village. A solemn and sad atmosphere prevailed as the two mourning mothers, Maria and Dikeledi Mosana, watched the tiny coffins of their children. Omphile and Bogosi were brothers, while Obakeng was their cousin. The funeral was also attended by pupils from Bogosi’s Marokolong Primary School, who stood together near the graves and listened to the obituaries of the three boys from people who were close to them and the principal Rehab Madumo. Omphile attended the Lesang Bana Day Care centre at the time of his death while Obakeng went to Legae La Mme Day Care. Family spokesperson Kate Mpete said: “We hope this would teach people that no matter what may be going on with the parents, children should not be harmed. These children had nothing to do with this. These deaths have hurt and broken us. This man killed other people’s children. Those children had their own fathers. Mpete said the death traumatised the mothers very much, especially that of the youngest child; he was so severely burnt that his head had burnt to ashes. She said forensic pathologists revealed that the other two children might have climbed on Obakeng when the vehicle was burning, resulting in his head burning to ashes. She said they were told that a burning tyre might have caused the fire. The community was outraged and shocked when the mother of the two boys revealed that her husband had sent her a message that read “sorry my love, you can’t see the children anymore”. He then killed himself.